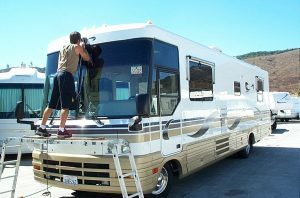 Schedule Your RV Detailing Appointment Today! We know that our customers are the driving force behind our success, and that constantly exceeding their expectations is the best way to stay successful in any business. It’s this mindset and philosophy that has kept us in business all these years, and it’s the reason why we’re always courteous and on time for our appointments. We know that when people come to us for mobile detailing services, they’re looking for the absolute highest quality service they can possibly receive. We know that if we go above and beyond your customers expectations they’ll continue to use us and our services. That’s why we’re confident that anyone who comes to us to detail their classic car or RV, truck or boat, will be blown away by what they see when the job is said and done. We know that results speak louder than words, which is why we let our work speak for itself. It says volumes more than we ever could. We pride ourselves on being the best mobile auto detailing service in Southern California. We provide a level of service that you simply can’t find anywhere else in Southern California. Our staff is highly trained in automotive detailing, and they have years of experience that gives us the edge on basically any detailing job. If you would like to get in touch with us, whether to tell us how much you love our work or to inquire about how we can make your auto, be it a car, truck, RV, boat, or anything else with an engine, look better than new, please either give us a call or fill out the form below. Don’t forget to ask about our Internet Rates!